If you have purchased a Gradwell router to use with your Fibre To The Cabinet (FTTC) service, the setup is simple. From September 2015 we have supplied a VDSL modem (either a Technicolor TG589n, a TG588v or a TG589vac) to use with this service, if you signed up for the service prior to this data please instead read the setup guide for the Technicolor TG582n router. 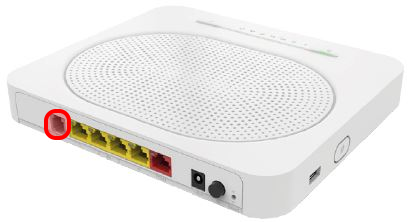 In advance of your go live date, you will receive the VDSL router. In the box is the router, power supply, cables, a card with the WiFi details and a VDSL filter. What happens on your go live date will depend on the type of order you have placed. If you already have broadband on your line, during your appointment slot your previous service will stop working. At this point, you can unplug and remove your old router before following the setup instructions below. 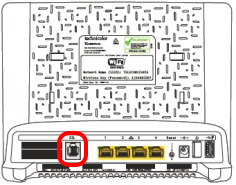 If you have previously used a Fibre To The Cabinet service, you can unplug the white Openreach modem that you have previously used as it is not required when using the TG589n or TG588v. If you are having a new line installed, an Openreach engineer will visit your property to complete the new line install. Once the engineer has completed the installation work you will be ready to plug in your new router following the instructions below. If you have a *standard socket*, then take the filter from the box the router was sent in and plug it in to the telephone socket. This has two sockets, you can plug any telephony equipment into the larger socket if you need to. Take the grey cable from the box and plug this into the smaller socket, and then plug the other end into the grey socket on the rear of the router. If you have a *filtered socket*, take the grey cable from the box and plug it into the top port of your telephone socket. Connect the other end to the grey socket on the rear of the router. 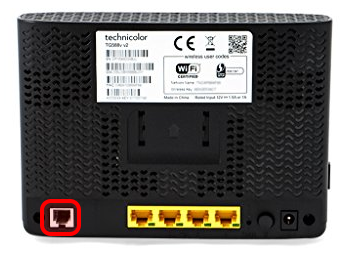 If you connect any equipment using an Ethernet cable, you can plug these into the yellow sockets on the rear of the router. Now take the power supply from the box and plug the router in. Switch it on using the power button on the rear of the unit. The router will begin its configuration process. This can take up to ten minutes - *please be patient and don't turn the router off during this time*. If after 10-15 minutes the Internet light on the front of the router remains red please contact our Customer Support Team without powering the unit down. Included in the box is the default SSID (wireless network name) and password that you need to connect via WiFi. This information can also be found on the rear of the router.